after weeks of intrigue, i decided to dip my toe into this pinning business over at pinterest. lets just say, i'm officially obsessed. are you with me? for those of you still wondering about pinterest, let me just give you a testimonial. i love saving and organizing favorite articles, magazine rip-outs, party ideas, projects, inspirational quotes, etc. into my three-ring binders, however the blogworld has overwhelmed me with awesome ideas i'm afraid i'll forget. pinterest to the rescue! with a super simple browser bookmarking system, you can pin (virtually) anything to keep handy for future reference. (i loved giving dan a tour of rooms for our future dream house.) 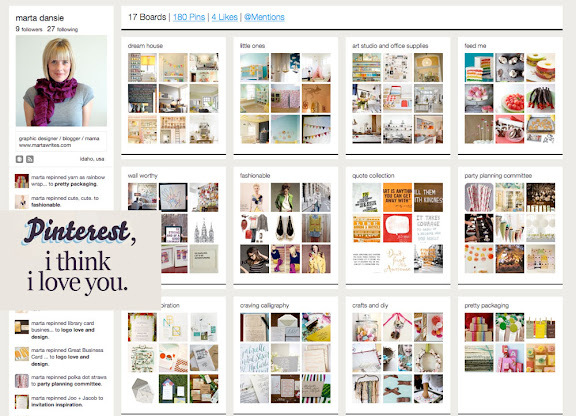 file your faves into neat inspiration boards and at a glance you are inspired by the things you love. i especially appreciate that your featured pins link directly back to their original sources, so you can easily track and re-read what you bookmarked. of course this wouldn't be a booming online resource if you couldn't follow your faves (ala twitter), so you can look up friends and favorite bloggers galore. you can re-pin what they like too. the connecting of the minds is a very nice bonus. so while i'm not blogging, i am over here pinning. come say hello. p.s. a client who runs a photog business recently came to me for a new logo design. she emailed me a link to her branding / identity pinterest board and ta da! suddenly we're on the same page about what type of design she is looking for. hurrah, hurrah. such a neat new way for me to get a glimpse of what a client is thinking! p.p.s. benji recently learned the term, ta da! and shouts it randomly throughout the day. too cute. what are your thoughts? do you pine for pinterest? why do you love it? Love pinterest! It's a fabulous concept! Before that I was using evernote, but this is just so easy - the inspiration boards are my favorite! woohoo! this post is dangerously exciting to me, marta. really. off to check out your pretty pins.. I haven't tried it yet, for fear of one more thing to take up (not necessarily "waste," but close) my time. But it looks pretty awesome, I must say. Hmmm! You've piqued my "pinterest!" Wocka wocka wocka. I couldn't resist the horrible pun. Thanks for stopping by and saying hello by the way! And I will check out pinterest; it seems like just the thing I've been missing! I have heard about pinterest three times in the past two days. It must be that good. Sounds like my kind of fun! i love pinterest! i love that i can stop emailing myself link after link. it was a bit of a time consumer when i first started because i transferred all of my emails into it, but now that i am caught up, it is a quick and easy thing for me to use. so visually delicious. i love that i can say, "i want a project," and i can just go to one of my boards and get a quick visual idea of some potential things i could do. I've been wondering about pinterest for awhile! I have a tumblr page... is it similar? Would it be redundant to have both a tumblr and pinterest? I'm eager to know more, so thanks for this great testimonial! hi marta! have been completely obsessed with pinterest for about 6 months now, i pin like crazy! glad i can follow you now, i'm sure your images are going to be fabulous! I too LOVE Pinterest! I used Evernote as well for my online stuff or a book mark, but I never seemed to go back to them. I also save stuff from magazines, have had binders going for years, and an Inspiration journal for the other stuff. THis is the online version for me. I love it. I love pinterest too! Miranda hooked me a couple months ago. Such a fun place. Can't wait to follow your pins! I just signed up yesterday (started following you!) and trying to figure out my way around, but I think I'm going to love it. I just need a tutorial! a good friend just got me started a few days ago. I am still getting my sea legs with the whole thing. my book mark bar is way too overloaded with tags- it will be nice to sit down and organize it all out. ah. this looks oh so dangerous. if only I had been using this rather than saving everything hard copy to my computer... then I could still have all my lovely ideas even though my laptop was stolen. I love pinterest too! Easy way to save ideas bust still have them organized. Just yesterday I decided that I wanted to try it, but I had to request an invitation through the website and now I am waiting. Is there a better way to do this? What am I missing? I really want to start using it now. I feel like my ideas are slipping out of my head as I wait! There really isn't anything to NOT love about Pinterest! I feel like I'm getting the best of the internet served on a silver platter! Thank you, thank you, thank you! I have not stopped pinning thanks to you. It's so addicting isn't it? I have already added you and look forward to all the goodness I find via you. It's such a handy little tool, isn't it? obsessed. officially. come visit me. Totally obsessed with it too - lol :) I am following you now! love. one might also say that i'm obsessed! Pinterest=awesome. Kind of wondering why I didn't think of that? Kind of loving that we have such similar taste in pins ;). this is very motivating. i know it's awesome, i just gotta get my pinning-groove on! I am pining away for Pinterest...I got wait listed but I can't wait to try it! Thanks for reminding me about it. I had signed up for an invite, which arrived in my email about a week ago, but I hadn't taken the time to actually play around with pininterest. Now that I have, I LOVE it! How do I get an invite. I don't get it. . . Can I have one? how to I get my own board. I want one! I have the same question...how do you receive an invite? :) I love, love, love the idea & can't wait to follow you. Will definitely make my idea collecting "system" easier! Thanks for the tip! Yay!!! =) I'm so glad pinterest worked how I imagined it would and that you liked it! for those of you needing a pinterest invite, please email me directly. thank you!! I'm doing pinterest too, for the same reasons you are. I've got so many clippings binders it's insane! I love Pin Interest. Addicted to it really. It's all I want to do when I'm on the computer. But, work usually wins by default. 2. ta da! how cute that Benji has made that his phrase now! Do you watch Modern Family? this past week there was a mini-discussion about the correct use of "ta da!". cute.